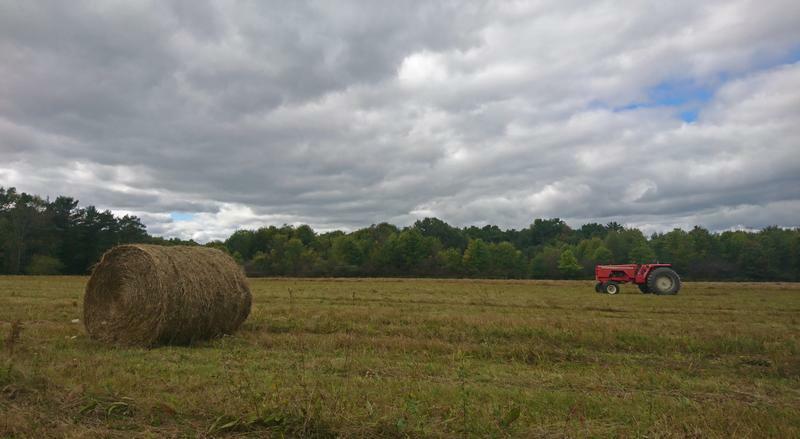 The Center for Rural Pennsylvania hosted a public hearing in Tioga County on Thursday, hearing from providers and consumers about the lack of broadband access in rural areas. Gillio, the hospital’s medical director for population health and clinical innovations, said he requested service from a provider after moving to Huntingdon, but was told it’d take $100,000 to have his neighborhood wired. The doctor is not alone. 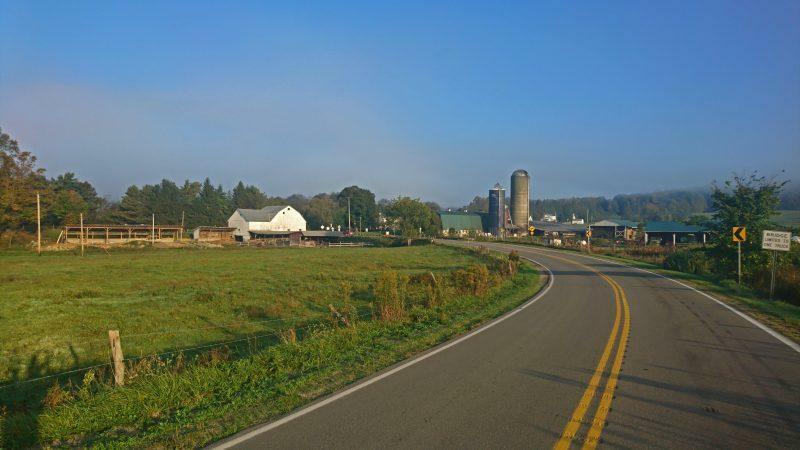 Gillio is one of 800,000 Pennsylvanians that lack access to high-speed broadband internet according to the Federal Communications Commission, an issue for six percent of the state. The majority, like Gillio, are from rural Pa.
Dr. Robert Gillio (left) is in charge of telemedicine at J.C. Blair Hospital in Huntingdon county. He testified on the need for broadband access. 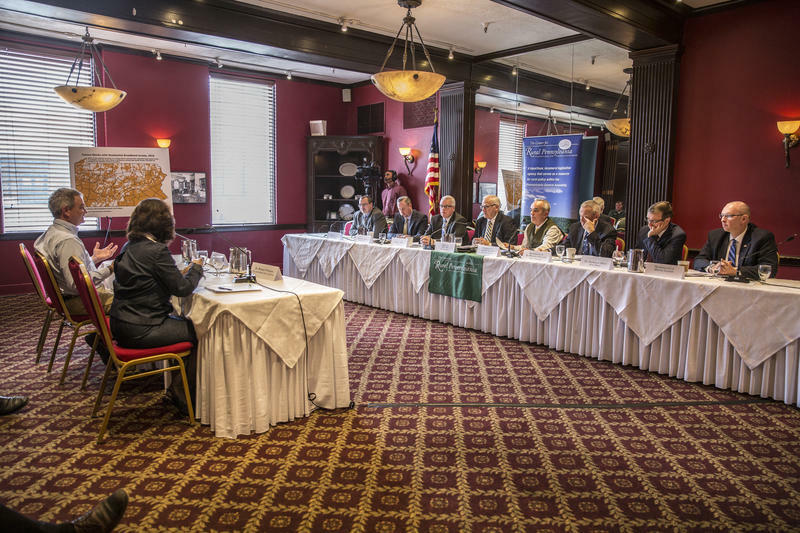 Gillio shared his story in testimony at a public hearing hosted by the Center for Rural Pennsylvania in Tioga County on Thursday. Similar to other problems facing rural areas in the state, the lack of access to broadband results from geographic isolation and low population density. But finding a solution to this problem has become especially pressing as high-speed internet has become a necessity that provides access to healthcare, business and education. 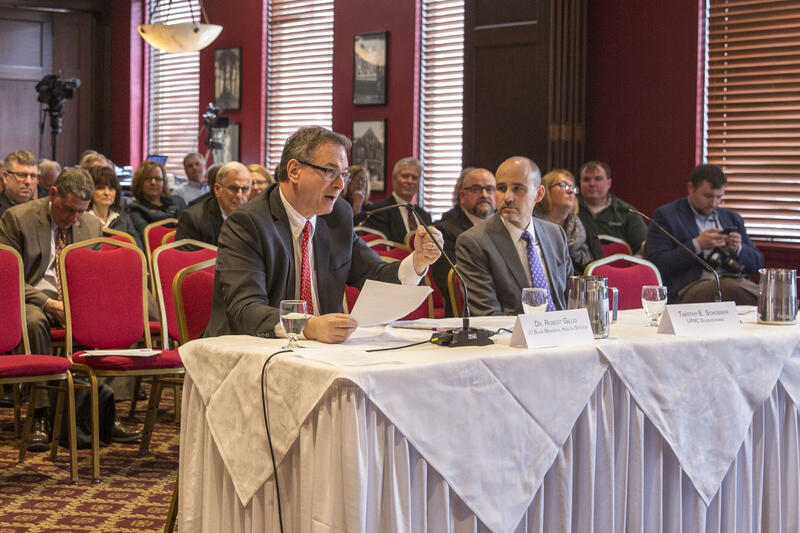 A panel of representatives from the Wellsboro Area School District, University of Pittsburgh Medical Center, local businesses and community groups testified to this effect at the hearing, detailing that technology has changed the way people work, and internet has become a crucial component. Barry Denk (center) and Sen. Gene Yaw (right) heard from providers and consumers. The FCC’s broadband estimates may actually undersell the extent of the issue, Denk noted. According to the FCC, if one person in a census block receives access to broadband, the service would be considered accessible to the entire block. Denk said a better estimation is one of the agency’s priorities. Broadband providers currently serving the state’s rural areas say it’s costly to build and maintain infrastructure in areas that are geographically isolated. Even when the facilities are established, the low population density keeps the price high. Blue Ridge Communications serves 15 counties in Pennsylvania. Some of the counties have a population of about 40 people per square mile. In his testimony, Thomas Freeman, general manager of the company, asked for more government incentives for private investments, as well as greater regulatory certainty. 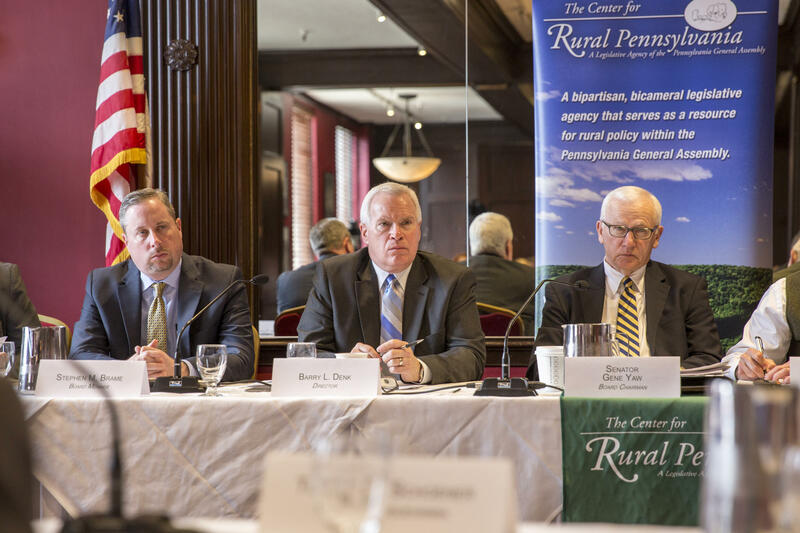 Governor Tom Wolf introduced the Pennsylvania Broadband Initiative last month, offering incentives to private providers to invest in rural Pennsylvania. But one of the providers at the hearing said the program’s requirement to provide download speeds of 100 Mbps was too high. Currently, the FCC’s definition of broadband is a download speeds of 25 Mbps and upload speeds of 3 Mbps. Mark Smith, executive director of Wolf’s broadband initiative team, said they set the 100 Mbps threshold after consulting with many providers, and that the administration wants to encourage high performance. Dr. Brenda Freeman, superintendent of the Wellsboro Area School District, said about 30 percent of the district’s students don’t have access to broadband.